Ultimate Sample Big Box, Other CD & Sound Bank from Sample Magic. Sample Magic announced a big sale bundle with ten of its sample libraries for £100. 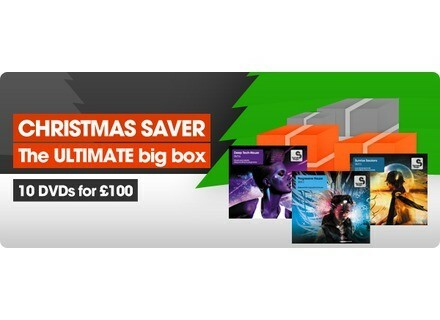 The Ultimate Sample Big Box, with ten of Sample Magic’s DVD collections, packing in 10,000+ samples and over 20GB worth of 24-bit loops and one-shots for £100 (plus P&P). Spanning genres from house and techno to prog, chillout, soundtrack, breaks and more, this is a saving of over £200. Complete DVD bundle costs £100 plus P&P (priority Fedex shipping worldwide). You can order it from www.samplemagic.com. Audiofile Engineering Quiztones for Mac Audiofile Engineering announce the release of Quiztones for Mac as well as an update to the iOS version for iPhone, iPad, and iPod touch. Tone2 FilterBank 3.3 Tone2 announced the 3.3 update of Filterbank, an analog modeled filter & synthesizer plugin bundle with routable modules and 58 filter types. Superstar O Discount Seven Kit Bundle Superstar O has released seven drum kits - and they all sound incredible.